Harikrishna went for an irregular opening as white and surprised Anand early. However, the world champion, who is on four points, got in to the groove pretty fast and after trading of the queens, stood better for major part of the game. Anand held by Harikrishna; Carlsen leads By Our Chess Correspondent Wijk Aan Zee (The Netherlands), Jan 19 (PTI) World champion Viswanathan Anand played out a draw with compatriot P Harikrishna and slipped to second spot at the end of the sixth round of Tata Steel Chess tournament on Saturday. World number one Magnus Carlsen of Norway shot in to sole lead after demolishing the defenses of Ivan Sokolov of Holland. The Norwegian took his tally to 4.5 points from six games to move ahead of overnight co-leaders Anand and Sergey Karjakin of Russia. On another interesting day in the traditional tournament, Levon Aronian of Armenia scored his second victory on the trot at the expense of Hungarian Peter Leko. Loek Van Wely rose back after losing to Harikrishna in the previous round and outplayed Wang Hao of China, while former world women's champion Yifan Hou of China caused a big upset defeating local star Anish Giri. With seven rounds still to go in the 14-player round-robin tournament, Harikrishna shares the fourth spot on 3.5 points along with Aronian and Hikaru Nakamura of United States. Leko and Van Wely are on seventh spot on three points each, a half point ahead of Fabiano Caruana of Italy. Yifan Hou, Anish Giri, Erwin L'Ami of Holland are on two points, a half more than Sokolov. Harikrishna to his credit, did not let his position worsen and when complexities arose, the Hyderabad based did not shy away from them. 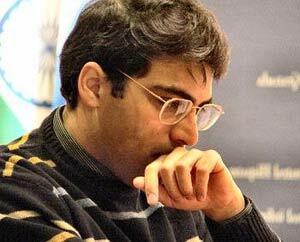 Anand gave up two pieces for a rook and the position was hard to judge when he proposed a draw after 41 moves. Harikrishna accepted without much ado. Carlsen was again at his technical best. After allowing Sokolov to attain equality out of a closed Ruy Lopez, the Norwegian went rampaging in queen and minor pieces endgame. It was another display of powerful chess that got Carlsen another point. Aronian outplayed Leko from a seemingly equal endgame. The Armenian went in to the minor piece endgame with an extra pawn and Leko thought his two Bishops would compensate it. However, Aronian kept looking for more and was rewarded when the players had reached an opposite coloured Bishops endgame. Yifan Hou got the better of Anish Giri out of a Sicilian Dragon. Playing black, the Chinese girl exerted pressure on the queen side and Giri's indifferent form was not useful for the Dutchman. Yifan sacrificed an exchange and emerged with an extra pawn in the endgame. Giri had to give an exchange himself to stay afloat for some more time but his resistance ended after 85 moves. Results, Round 6: V Anand (Ind, 4) drew with P Harikrishna (Ind, 3.5); Magnus Carlsen (Nor, 4.5) beat Ivan Sokolov (Ned, 1.5); Anish Giri Ned, 2) lost to Yifan Hou (Chn, 2); : Peter Leko (Hun, 3) lost to Levon Aronian (Arm, 3.5); Hikaru Nakamura (Usa, 3.5) drew with Erwin L'Ami (Ned, 2); Loek Van Wely (Ned, 3) beat Wang Hao (Chn, 3); Sergey Karjakin (Rus, 4) drew with Fabiano Caruana (Ita, 2.5).